With the ashtray in the beach and a handful of sand inside it, the beach ashtray can be used to extinguish cigarettes by placing them directly into the sand inside the beach ashtray. These cigarettes can then be stored until the ashtray is emptied. 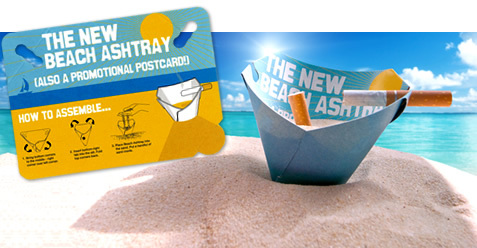 Creating a beach ashtray from the postcard is simple. First fold the bottom corners up, place the tab into the slit, fold the top corners back and then put the beach ashtray into the beach and place a handful of sand inside. Cigarettes are placed into the sand inside the beach ashtray, where they extinguish within seconds. When finished with, the beach ashtray is removed from the beach, allowing the sand to drain from the hole at the bottom, but retaining the cigarettes inside the beach ashtray. It can then the emptied and then folded flat for reuse. Essentially, the Postcard Beach Ashtray from boodi is a self-assembly beach ashtray that can be used for advertising and promotion, whilst simultaneously preventing cigarette litter on beaches; by giving smokers somewhere handy to extinguish and store their cigarettes. With any type of free ashtray, the distribution of it is important - getting it into the hands of the people who will see the printed messages and use it as an ashtray on the beach. This is why we have made it the size of a standard postcard, so it can be offered and displayed alongside other postcards and promotional material on postcard display stands, shop/ tobacconist counter tops, bar tops, tourist information points, etc. Millions of cigarettes are dropped on beaches worldwide every month, which is why it is important that organizations tackle the problem with an effective solution. Since this is a postcard that turns into a beach ashtray, it can be printed front and back, perhaps with anti-litter related messages in order to raise awareness of the beach litter problem. If you would like a quotation, or have any questions, please either use the form on the right, email info@boodi.co.uk or phone 01535 610066 (from outside UK: 00 44 1535 610066). If you would like a quotation, please complete and submit the form below. Required fields are marked with *. How many beach ashtrays do you require?